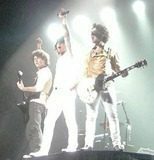 The Jonas Brothers, a sibling band comprised of Nick, Kevin, and Joe Jonas, has left their former Disney label, Hollywood Records, and gone their own way. But what that new destiny may entail is unknown at this point. “There’s no plan here — the plan is whatever we decide to make it,” said Wright. He did add that he expects the group will have a new album out by late 2012 or early 2013.